18 APRIL 1570: THE FUNERAL of Sir William Herbert, 1st Earl of Pembroke took place at Old St. Paul’s Cathedral in London. Pembroke had been the husband of Lady Anne (Parr), sister of the late Queen Katherine and the Marquess of Northampton. Lord Pembroke died on 17 March 1570 at Hampton Court Palace. William was eldest son of Sir Richard Herbert of Ewyas, Herefordshire, by his wife Margaret, daughter of Sir Matthew Cradock of Swansea. Pembroke’s father, Sir Richard, was an illegitimate son of the original Herbert first creation of the Earldom, William Herbert, 1st Earl of Pembroke (d. 1469), by a mistress, Maud, daughter of Adam ap Howell Graunt. He married firstly to Anne Parr in 1538 and after her death, Lady Anne Talbot, daughter of the Earl of Shrewsbury. Parr gave Pembroke an heir (the 2nd Earl), an heir to spare (ancestor to the Earls of Powis), and a daughter (no issue). Talbot had no issue by Pembroke. 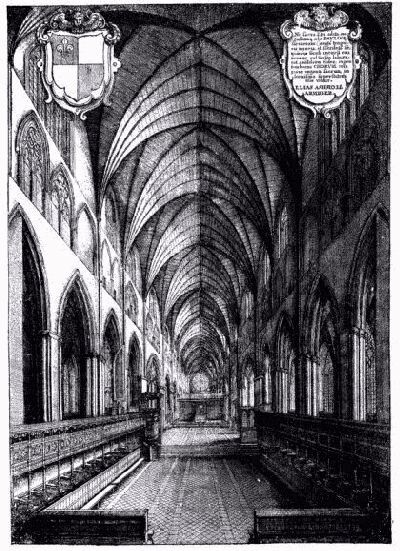 In his will, Pembroke listed two possible burial places; Old Saint Paul’s or Canterbury Cathedral. 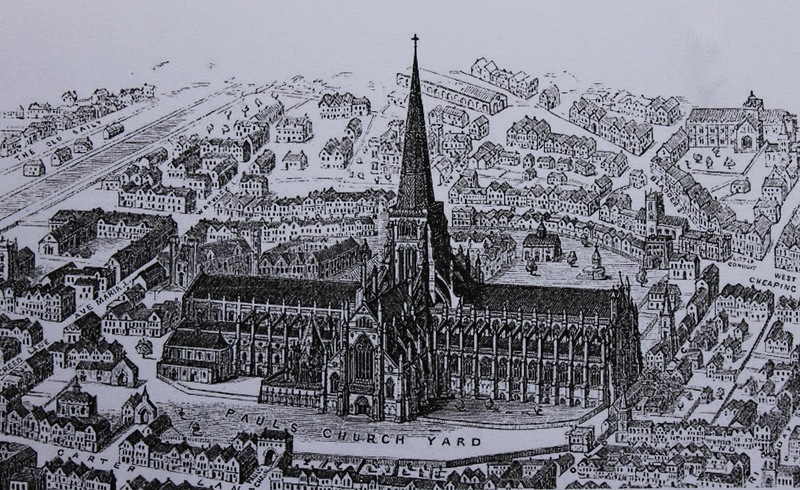 If he died near London, his wishes were to be buried in St. Paul’s Cathedral next to his first wife, Lady Anne (Parr). Pembroke obviously loved his wife for when he wrote his will, despite being married again, he wanted nothing more than to be buried “near the place where Anne my late wife doth lie buried” in St. Paul’s. On Tuesday, 18 April 1570, Pembroke was buried with great state and ceremony in Old St. Paul’s Cathedral. His funeral was attended by all the principle members of the Government, as well as all the numerous officers of his household. A full list is provided in “Wiltshire Archaeological and Natural History Society,” 1879. The list states the various positions and who attended to them. Chief Mourner: Sir Henry Herbert, 2nd Earl of Pembroke (eldest son of Lord Pembroke). One of the three knights with their hoods on their shoulders included Sir Francis Knollys. “The proceedinge to the offringe as heerafter folowith: First the chief mourner, his trayne borne, and all the rest of the mourners to folowe and none to offerre but he and the officers of Arms before him. Then the chief mourner to goe upp alone, and to offerre for himself, and ther to remayne untill all the hatchements be offred, whiche he shall receyve and delyuer to York Herauld, who shall set theim one the communion boord: then he to be brought downe agayne to his place. Then the hatchements to be offred as folowith, and at all tymes…Herauld before them..
“Wiltshire Archaeological and Natural History Society,” Devizes: Wiltshire Archaeological and Natural History Society, 1879. pg 128-31. George Clinch. “St. Paul’s Cathedral, London,” Methuen, London, 1906. pg 47. William Benham. “Old St. Paul’s Cathedral,” Seeley and Co., London, 1902. Wenceslaus Hollar. “Tomb of William Herbert, Earl of Pembroke,” British Museum Online, engraving, 1658. Heritage Images. “Tomb of William Herbert, Earl of Pembroke” — color. Lady Anne Herbert [Parr], Countess of Pembroke died at Baynard’s Castle on 20 February 1552; at the age of thirty-six. Lady Pembroke had out-lived her sister, the Dowager Queen Katherine (d. 5 September 1548), who had also died in the year of her thirty-sixth birthday (Katherine was born in 1512, no official date is recorded). Unlike her sister and brother, the Marquess of Northampton, Lady Pembroke left two sons and a daughter to continue her legacy. Lady Pembroke was buried with huge pomp in Old St. Paul’s Cathedral in London next to her ancestor Prince John of Gaunt, 1st Duke of Lancaster [and his first wife, Blanche of Lancaster] on 28 February 1552. The tomb is located between the choir and the North aisle. The tomb was by the magnificent tomb of John of Gaunt, Duke of Lancaster and Blanche of Lancaster, between the pillars of the 6th bay of the Choir. 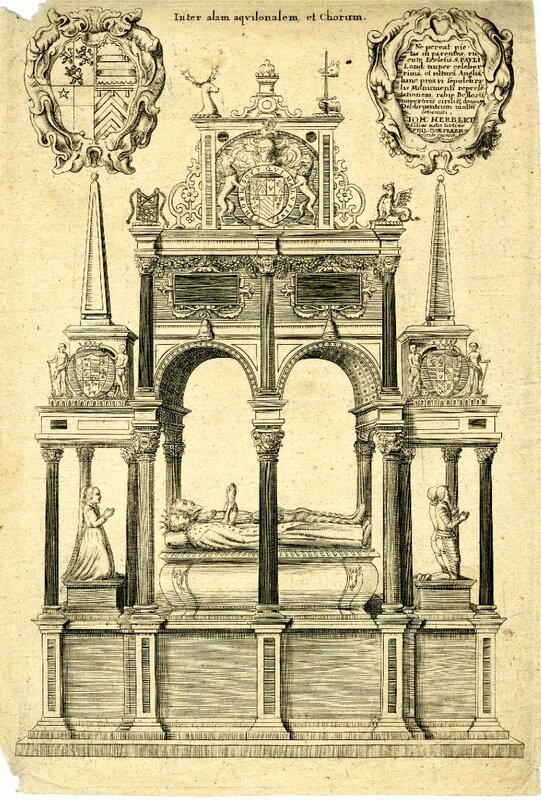 (Benham) The Pembroke tomb was a magnificent structure consisting of effigies of the earl and his Lady Pembroke lying on a sarcophagus, attended by kneeling children, and the whole covered by an elaborate canopy resting on stone shafts. (Clinch) Her memorial there read: “a most faithful wife, a woman of the greatest piety and discretion” and “Her banners were set up over her arms set on divers pillars.“ On her tomb her epitath read that she had been “very jealous of the fame of a long line of ancestors.“ Her husband, Lord Pembroke, died on 17 March 1570 and by his wishes was also buried in St. Paul’s Cathedral on 18 April 1570 next to Lady Pembroke. Lady Pembroke figure, Wiltshire Archeological and Natural History Magazine, 1879, pg 98. 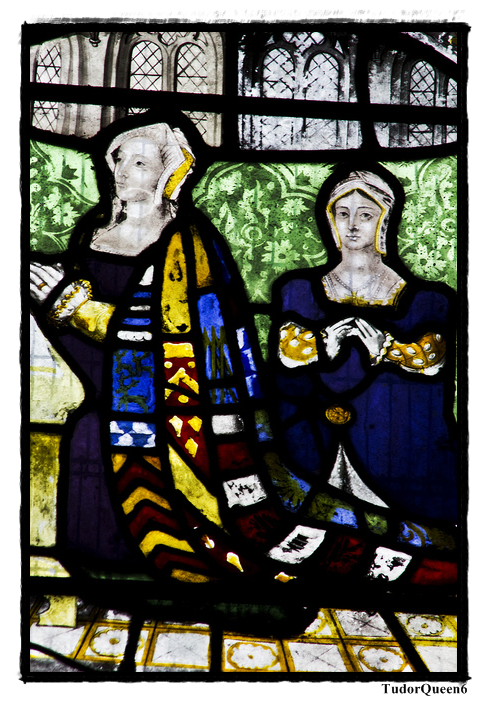 In her honor, in the old chapel at Wilton House was preserved a stained glass window in which were painted the kneeling figures of Lord Pembroke and his two sons also that of his wife Anne Parr and her daughter (also named Anne). The glass is now removed to the new Church at Wilton and will be found in the first window to the right on entering. Lady Pembroke is represented as wearing a rich mantle covered with her armorial bearings. 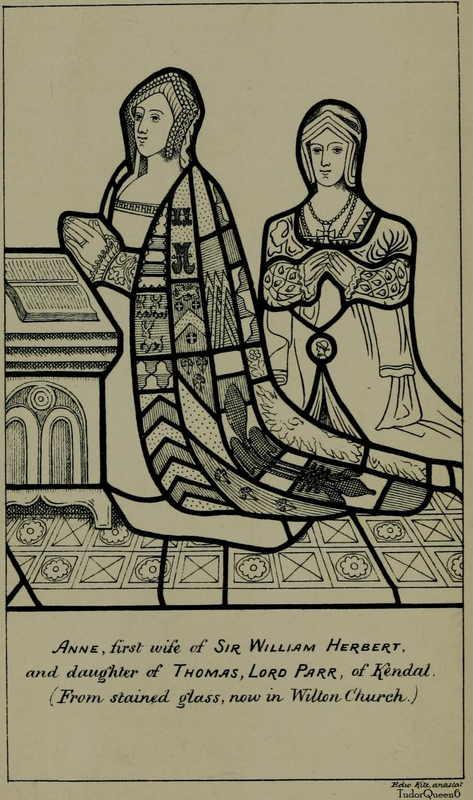 Lady Pembroke and her daughter, also named Anne (Lady Talbot). Wilton Church. This last quartering now replaced by a fragment of flowered glass was no doubt that of Gernegan–barry of ten Or and Azure an eagle displayed Argent. Wiltshire Archaeological and Natural History Society. “Wiltshire archaeological and natural history magazine,” Vol 18, 1879. Adam Nicholson. “Quarrel with the King,” HarperCollins, Oct 6, 2009. pg 63-4.